Download "TENNESSEE TECHNOLOGICAL UNIVERSITY. Department Of Counseling and Psychology. 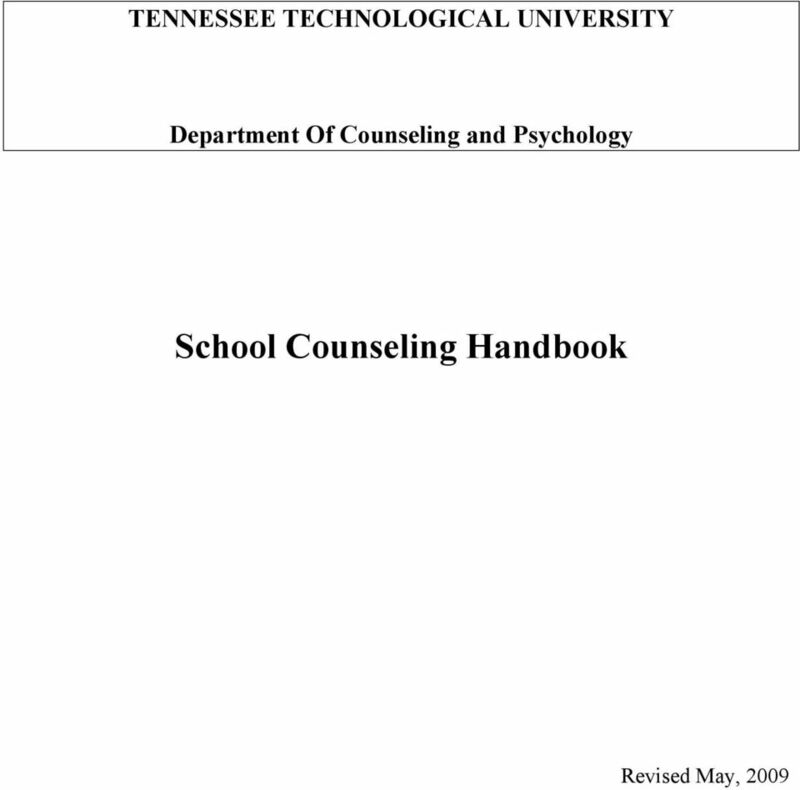 School Counseling Handbook"
4 3 PURPOSE OF THIS HANDBOOK The present document is intended to introduce students to the requirements for the satisfactory completion of TTU s School Counseling concentration. Included in this document is information concerning required paperwork, processes for selection of schools and site supervisors/mentors, and suggestions for effective interaction among TTU, site supervisors and the school counseling graduate student/intern. The document will identify prerequisites for internship at both the MA and EdS levels. No one source can hope to prepare an intern for all situations at a placement site. 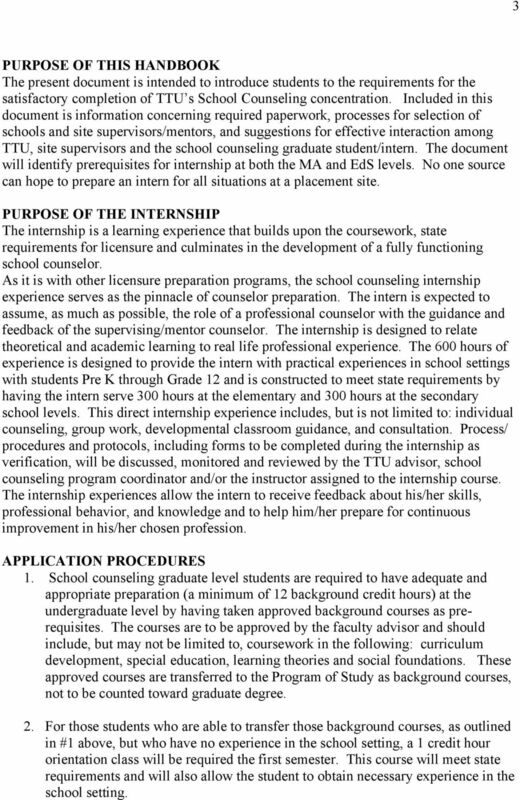 PURPOSE OF THE INTERNSHIP The internship is a learning experience that builds upon the coursework, state requirements for licensure and culminates in the development of a fully functioning school counselor. As it is with other licensure preparation programs, the school counseling internship experience serves as the pinnacle of counselor preparation. The intern is expected to assume, as much as possible, the role of a professional counselor with the guidance and feedback of the supervising/mentor counselor. The internship is designed to relate theoretical and academic learning to real life professional experience. The 600 hours of experience is designed to provide the intern with practical experiences in school settings with students Pre K through Grade 12 and is constructed to meet state requirements by having the intern serve 300 hours at the elementary and 300 hours at the secondary school levels. This direct internship experience includes, but is not limited to: individual counseling, group work, developmental classroom guidance, and consultation. Process/ procedures and protocols, including forms to be completed during the internship as verification, will be discussed, monitored and reviewed by the TTU advisor, school counseling program coordinator and/or the instructor assigned to the internship course. The internship experiences allow the intern to receive feedback about his/her skills, professional behavior, and knowledge and to help him/her prepare for continuous improvement in his/her chosen profession. 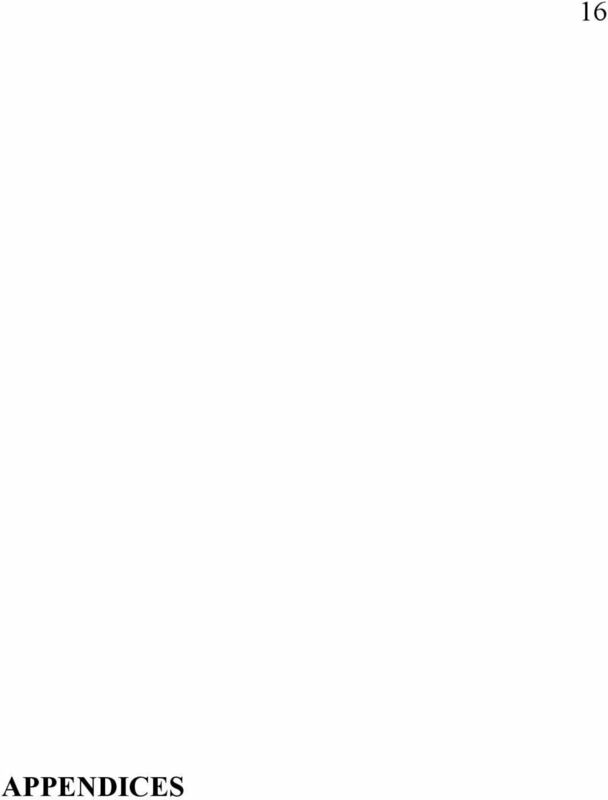 APPLICATION PROCEDURES 1. School counseling graduate level students are required to have adequate and appropriate preparation (a minimum of 12 background credit hours) at the undergraduate level by having taken approved background courses as prerequisites. The courses are to be approved by the faculty advisor and should include, but may not be limited to, coursework in the following: curriculum development, special education, learning theories and social foundations. These approved courses are transferred to the Program of Study as background courses, not to be counted toward graduate degree. 2. For those students who are able to transfer those background courses, as outlined in #1 above, but who have no experience in the school setting, a 1 credit hour orientation class will be required the first semester. This course will meet state requirements and will also allow the student to obtain necessary experience in the school setting. 5 4 3. 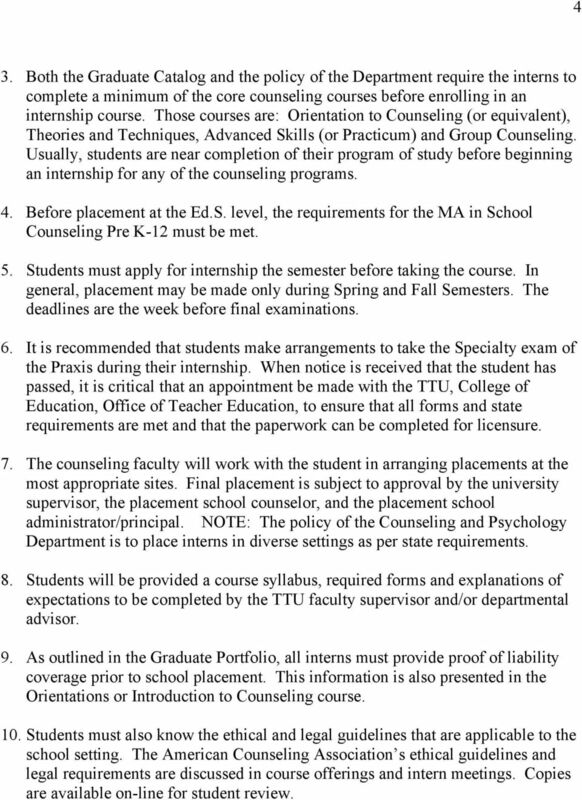 Both the Graduate Catalog and the policy of the Department require the interns to complete a minimum of the core counseling courses before enrolling in an internship course. Those courses are: Orientation to Counseling (or equivalent), Theories and Techniques, Advanced Skills (or Practicum) and Group Counseling. Usually, students are near completion of their program of study before beginning an internship for any of the counseling programs. 4. Before placement at the Ed.S. 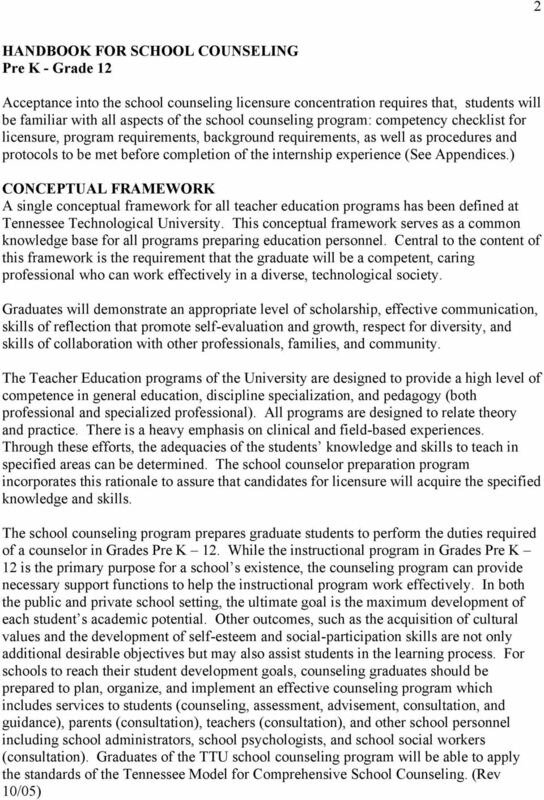 level, the requirements for the MA in School Counseling Pre K-12 must be met. 5. Students must apply for internship the semester before taking the course. In general, placement may be made only during Spring and Fall Semesters. The deadlines are the week before final examinations. 6. It is recommended that students make arrangements to take the Specialty exam of the Praxis during their internship. When notice is received that the student has passed, it is critical that an appointment be made with the TTU, College of Education, Office of Teacher Education, to ensure that all forms and state requirements are met and that the paperwork can be completed for licensure. 7. The counseling faculty will work with the student in arranging placements at the most appropriate sites. Final placement is subject to approval by the university supervisor, the placement school counselor, and the placement school administrator/principal. NOTE: The policy of the Counseling and Psychology Department is to place interns in diverse settings as per state requirements. 8. Students will be provided a course syllabus, required forms and explanations of expectations to be completed by the TTU faculty supervisor and/or departmental advisor. 9. As outlined in the Graduate Portfolio, all interns must provide proof of liability coverage prior to school placement. This information is also presented in the Orientations or Introduction to Counseling course. 10. Students must also know the ethical and legal guidelines that are applicable to the school setting. The American Counseling Association s ethical guidelines and legal requirements are discussed in course offerings and intern meetings. Copies are available on-line for student review. 6 5 ROLES AND RESPONSIBILITIES OF SUPERVISORS University Supervisor. The university supervisor assists students in completing the internship experience. The supervisor will provide timely supervision, critique student work products, consult with the mentor counselor concerning the intern s progress, assure all required forms are completed, assess performance and assign the course grade. In short, the university supervisor will assist the intern to meet university and state requirements and to prepare the intern for licensure. Site Supervisor/Mentor Counselor. Site supervisors (sometimes called mentor counselors), are licensed, experienced professionals in the school systems in which the intern is placed. These site counselors must be licensed by the Board of Education. They must have a minimum of two years experience as licensed, practicing school counselors. As much as possible, counselors are expected to be active in professional organizations and professional community activities. The mentor counselors will be selected by the university/faculty supervisor in cooperation with the school administrators; the student s needs relevant to location, previous knowledge of the school and/or staff, will be taken into consideration. The site supervisor counselor is to provide on-site supervision, guidance and mentoring to the intern. The mentor will assist the intern in completing the experience at that site, discuss progress, communicate with university supervisor as needed and participate in the evaluation of the student. GENERAL REQUIREMENTS 1. Ideally, the MA and Ed.S contact hours will be completed during the course of a semester. However, TTU is cognizant of the fact that a majority of students are not full-time students. Part-time students must register for the internship course before starting their placement. Those students not completing internship requirements during the semester will be awarded a grade of I. The intern will have one year to remove the I before it turns into an F. (See University Catalog). All students, both full and part-time students must work closely with their site and university/faculty supervisors to ensure all requirements are met. 2. 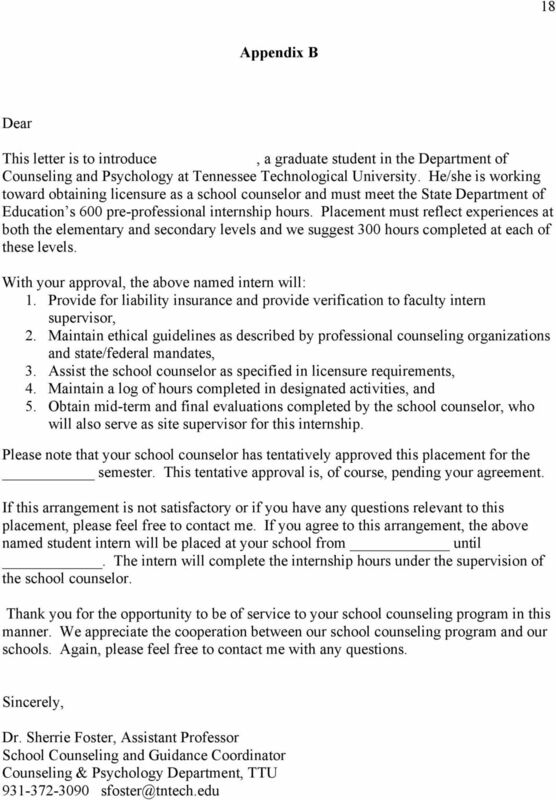 Prior to placement, the intern will have an initial interview with the mentor counselor at the school site. This meeting may be arranged by either the student or the faculty supervisor. Faculty supervisors must have prior knowledge of this interview to help prepare the student for this face-to-face at the selected site. 3. 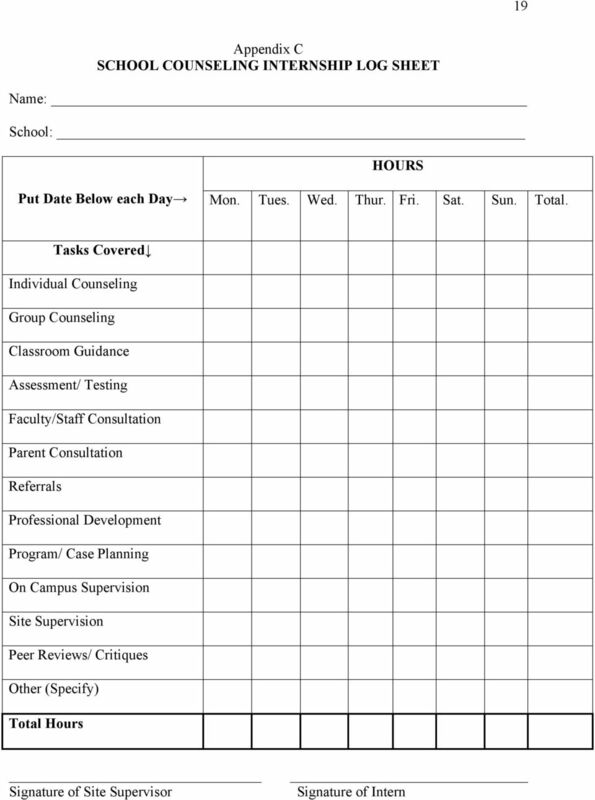 The intern and supervising school counselor will mutually develop a schedule for the experience. 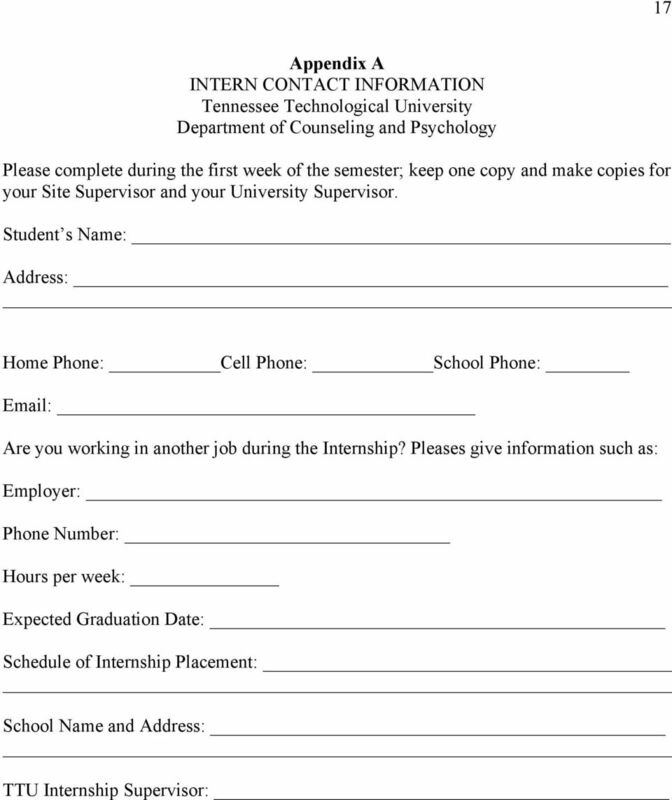 Interns are required to keep a log of their activities which will be verified by the mentor counselor and presented to the university supervisor. Examples of logs are available from the university supervisor and will be provided before the internship begins. 4. 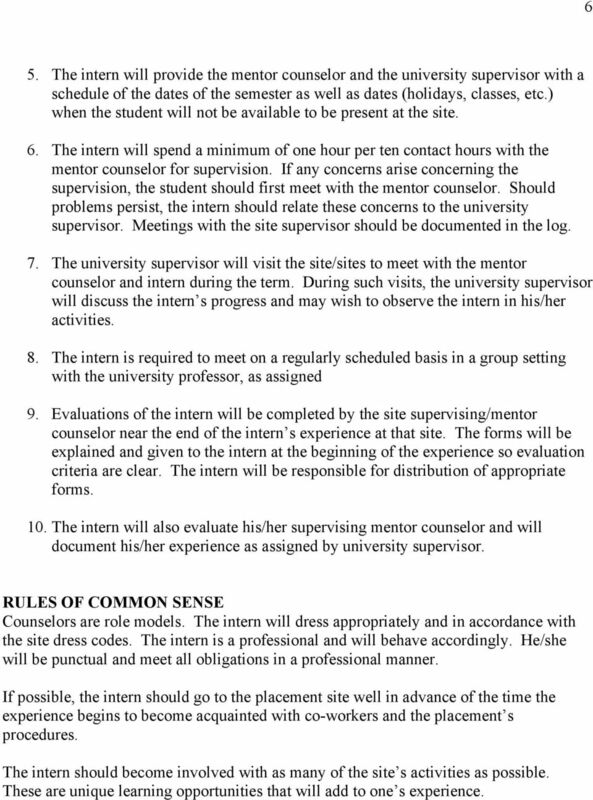 The intern is expected to complete a number of on-site assignments required by the site and the university supervisor. These will be clearly communicated. 7 6 5. The intern will provide the mentor counselor and the university supervisor with a schedule of the dates of the semester as well as dates (holidays, classes, etc.) when the student will not be available to be present at the site. 6. 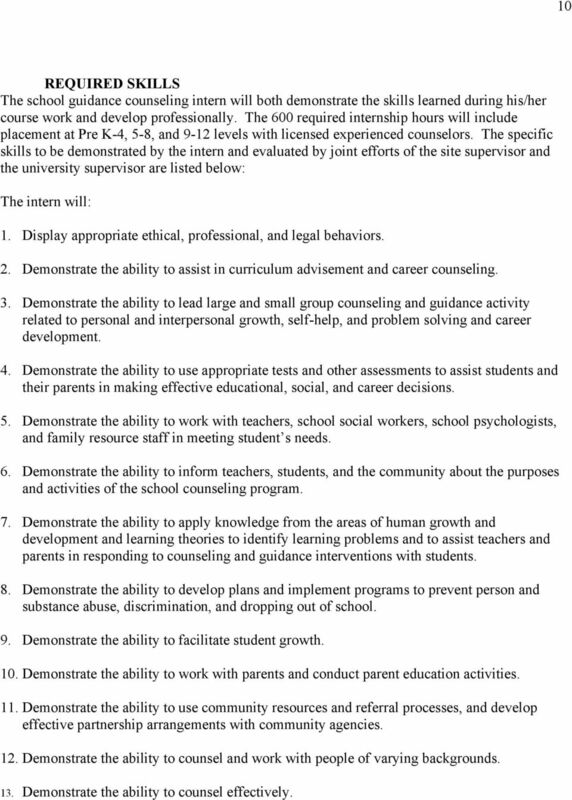 The intern will spend a minimum of one hour per ten contact hours with the mentor counselor for supervision. If any concerns arise concerning the supervision, the student should first meet with the mentor counselor. Should problems persist, the intern should relate these concerns to the university supervisor. Meetings with the site supervisor should be documented in the log. 7. 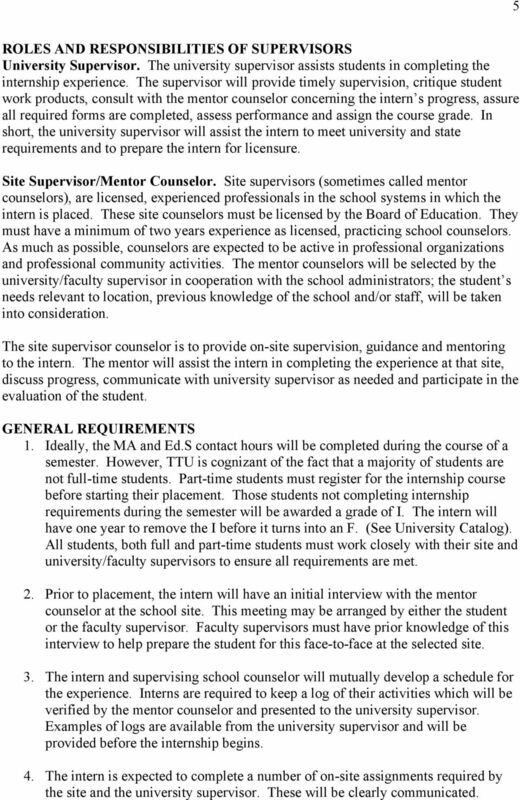 The university supervisor will visit the site/sites to meet with the mentor counselor and intern during the term. During such visits, the university supervisor will discuss the intern s progress and may wish to observe the intern in his/her activities. 8. The intern is required to meet on a regularly scheduled basis in a group setting with the university professor, as assigned 9. Evaluations of the intern will be completed by the site supervising/mentor counselor near the end of the intern s experience at that site. The forms will be explained and given to the intern at the beginning of the experience so evaluation criteria are clear. The intern will be responsible for distribution of appropriate forms. 10. The intern will also evaluate his/her supervising mentor counselor and will document his/her experience as assigned by university supervisor. RULES OF COMMON SENSE Counselors are role models. The intern will dress appropriately and in accordance with the site dress codes. The intern is a professional and will behave accordingly. He/she will be punctual and meet all obligations in a professional manner. If possible, the intern should go to the placement site well in advance of the time the experience begins to become acquainted with co-workers and the placement s procedures. The intern should become involved with as many of the site s activities as possible. These are unique learning opportunities that will add to one s experience. 9 8 patterns. Ability to develop plans and programs to prevent person and substance abuse, discrimination, and dropping out of school. 3. Understanding of the philosophical basis underlying the helping process. Ability to facilitate student growth and development and positive systemic change through counseling, advocacy, leadership, collaboration, and consulting activities, including contributing to the development and implementation of individualized educational programs (IEPs) for students with special needs. 4. Ability to lead large and small group counseling and guidance activities related to personal and interpersonal growth, self-help and problem solving, and career development. 5. Understanding changes in society and technology and the influence of changes on work and learning. Ability to develop and implement a comprehensive career development program. 6. Ability to assist in curriculum advisement and career counseling using a variety of materials, strategies, and technologies. 7. Understanding of appropriate tests and other assessments to assist students and their parents in making effective educational, social, and career decisions. Ability to use group-administered educational and psychological measurement and appraisal instruments. 8. 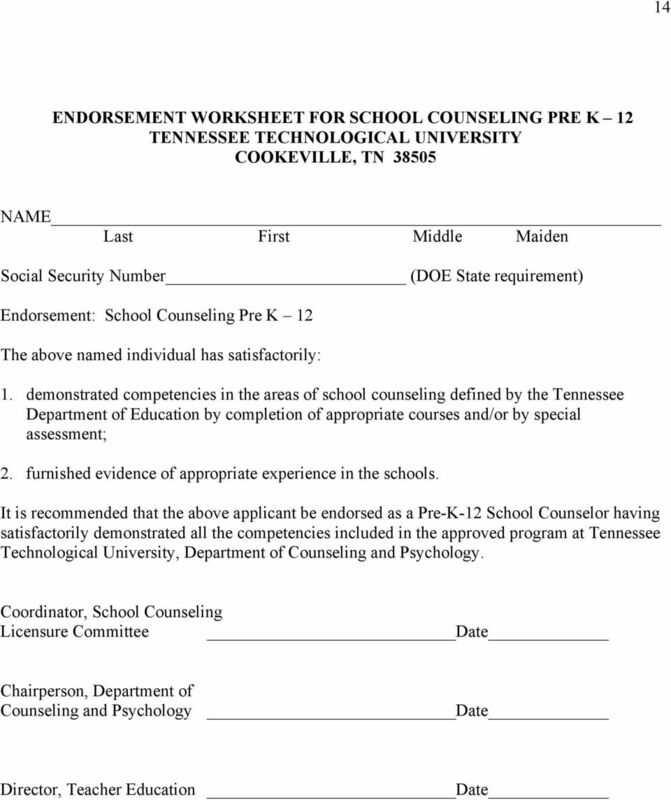 Ability to plan, manage, deliver, and evaluate a comprehensive PreK-12 professional school counseling program. Understanding of research and research design. Ability to conduct research and evaluation projects related to the outcomes of professional school counseling services. 9. Understanding of the ethical and legal standards of school counseling professionals. 10. Ability to collaborate with parents, teachers, school social workers, school psychologists, family resource center staff, and other community partners in meeting student needs. 11. Ability to inform students, teachers, parents, and the community about the purposes and activities of the professional school counseling program. 12. Ability to work with parents and conduct parent education activities. Ability to use community resources and referral processes, and develop effective partnership arrangements with community agencies. 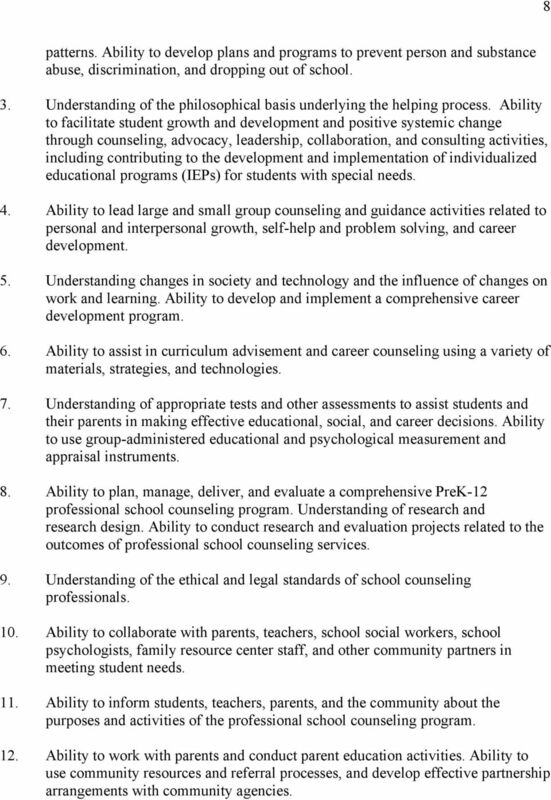 10 9 PHILOSOPHICAL FRAMEWORK The purpose of a counseling program within an educational setting, such as the public schools, is to promote and enhance the learning process for all students. 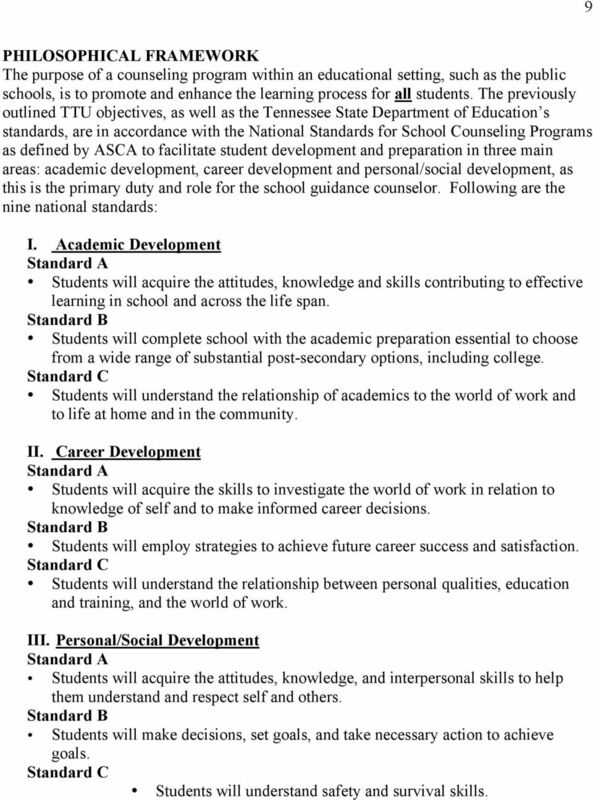 The previously outlined TTU objectives, as well as the Tennessee State Department of Education s standards, are in accordance with the National Standards for School Counseling Programs as defined by ASCA to facilitate student development and preparation in three main areas: academic development, career development and personal/social development, as this is the primary duty and role for the school guidance counselor. Following are the nine national standards: I. Academic Development Standard A Students will acquire the attitudes, knowledge and skills contributing to effective learning in school and across the life span. Standard B Students will complete school with the academic preparation essential to choose from a wide range of substantial post-secondary options, including college. Standard C Students will understand the relationship of academics to the world of work and to life at home and in the community. II. Career Development Standard A Students will acquire the skills to investigate the world of work in relation to knowledge of self and to make informed career decisions. Standard B Students will employ strategies to achieve future career success and satisfaction. Standard C Students will understand the relationship between personal qualities, education and training, and the world of work. III. Personal/Social Development Standard A Students will acquire the attitudes, knowledge, and interpersonal skills to help them understand and respect self and others. Standard B Students will make decisions, set goals, and take necessary action to achieve goals. Standard C Students will understand safety and survival skills. 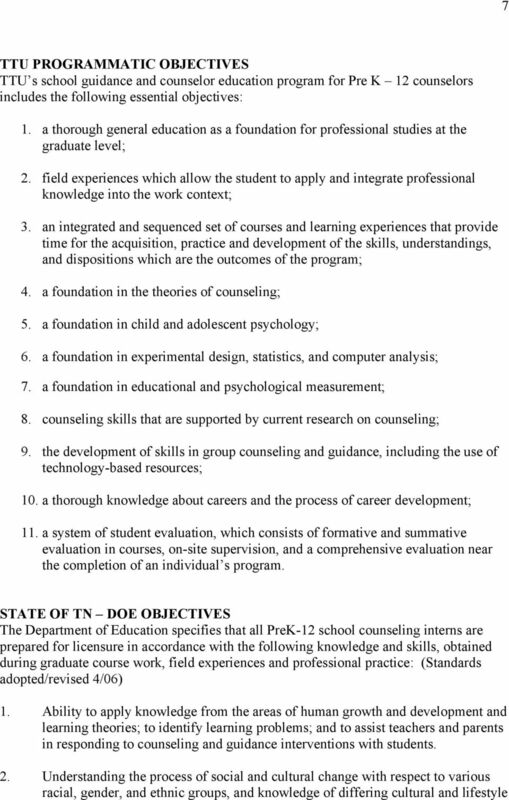 11 10 REQUIRED SKILLS The school guidance counseling intern will both demonstrate the skills learned during his/her course work and develop professionally. The 600 required internship hours will include placement at Pre K-4, 5-8, and 9-12 levels with licensed experienced counselors. The specific skills to be demonstrated by the intern and evaluated by joint efforts of the site supervisor and the university supervisor are listed below: The intern will: 1. Display appropriate ethical, professional, and legal behaviors. 2. Demonstrate the ability to assist in curriculum advisement and career counseling. 3. Demonstrate the ability to lead large and small group counseling and guidance activity related to personal and interpersonal growth, self-help, and problem solving and career development. 4. Demonstrate the ability to use appropriate tests and other assessments to assist students and their parents in making effective educational, social, and career decisions. 5. Demonstrate the ability to work with teachers, school social workers, school psychologists, and family resource staff in meeting student s needs. 6. Demonstrate the ability to inform teachers, students, and the community about the purposes and activities of the school counseling program. 7. Demonstrate the ability to apply knowledge from the areas of human growth and development and learning theories to identify learning problems and to assist teachers and parents in responding to counseling and guidance interventions with students. 8. Demonstrate the ability to develop plans and implement programs to prevent person and substance abuse, discrimination, and dropping out of school. 9. Demonstrate the ability to facilitate student growth. 10. Demonstrate the ability to work with parents and conduct parent education activities. 11. Demonstrate the ability to use community resources and referral processes, and develop effective partnership arrangements with community agencies. 12. Demonstrate the ability to counsel and work with people of varying backgrounds. 13. Demonstrate the ability to counsel effectively. 12 11 ADDITIONAL RELEVANT INFORMATION Insurance: All interns must have liability insurance before placement. 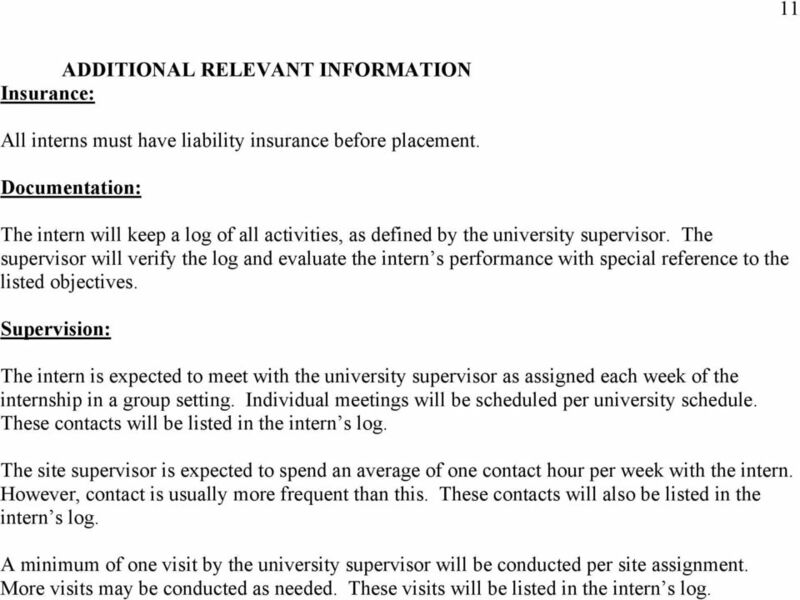 Documentation: The intern will keep a log of all activities, as defined by the university supervisor. The supervisor will verify the log and evaluate the intern s performance with special reference to the listed objectives. Supervision: The intern is expected to meet with the university supervisor as assigned each week of the internship in a group setting. Individual meetings will be scheduled per university schedule. These contacts will be listed in the intern s log. The site supervisor is expected to spend an average of one contact hour per week with the intern. However, contact is usually more frequent than this. These contacts will also be listed in the intern s log. A minimum of one visit by the university supervisor will be conducted per site assignment. More visits may be conducted as needed. These visits will be listed in the intern s log. 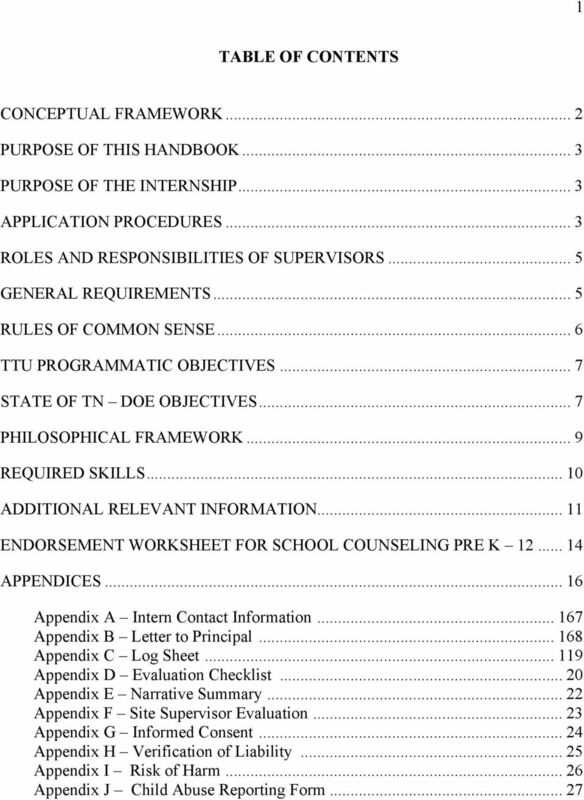 21 20 Appendix D INTERN EVALUATION CHECKLIST Name of Intern: Site of Placement: Please rate intern using the following scale in each of the listed competencies: 1. Outstanding 2. Good 3. Average 4. Below Average 5. Not Satisfactory 6. Not Observed The intern: 1. Displayed appropriate ethical, professional and legal behaviors. 2. Demonstrated the ability to assist in curriculum advisement and career counseling. 3. Demonstrated the ability to lead large and small group counseling and guidance activity related to personal and interpersonal growth, self help, and problem solving and career development. 4. Demonstrated the ability to use appropriate tests and other assessments to assist students and their parents in making effective educational, social, and career decisions. 5. Demonstrated the ability to work with teachers, school social workers, school psychologists, and family resource staff in meeting student needs. 6. Demonstrated the ability to inform teachers, students, and the community about the purposes and activities of the school counseling program. 7. Demonstrated the ability to apply knowledge from the areas of human growth and development and learning theories to identify learning problems and to assist teachers and parents in responding to counseling and guidance interventions with students. 8. Demonstrated the ability to develop plans and implement programs to prevent person and substance abuse, discrimination, and dropping out of school. 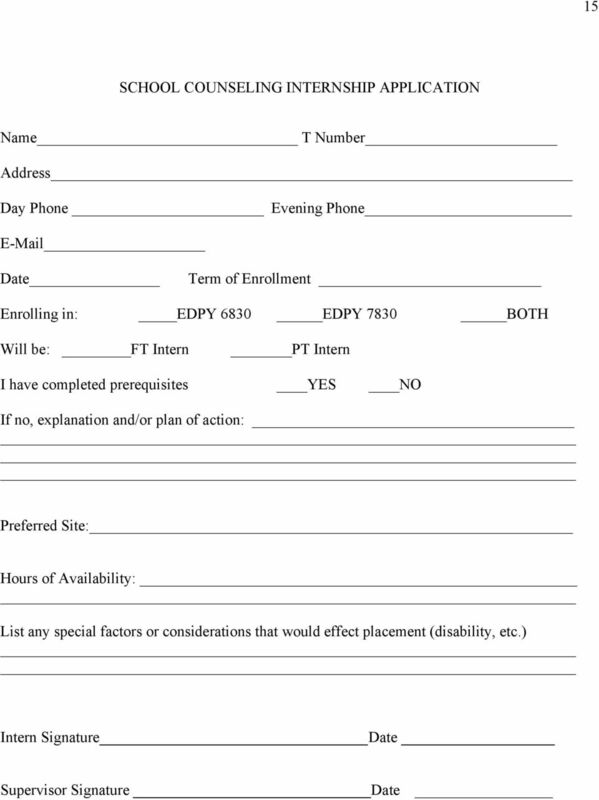 Practicum Registration Department of Counselor Education Adams State University Complete this form with your prospective Site Supervisor. Save the form as your last name and name of course, e.g. Doe_Practicum. 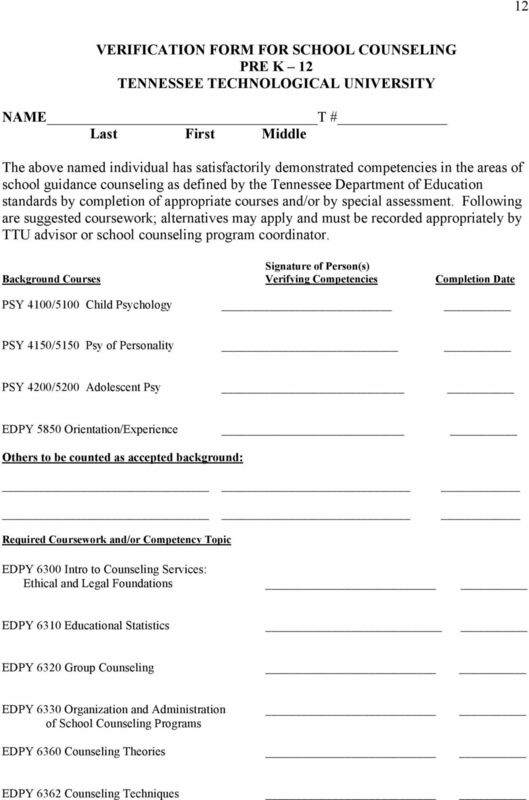 COUN 5570.01N: SUPERVISED EXPERIENCE IN SCHOOL COUNSELING. Northwestern State University of LA. Readings as assigned by instructor. No text required. INTERNSHIP MANUAL. Rehabilitation Counseling and Administration Program Rehabilitation Institute Southern Illinois University Carbondale. 1. List proposed program changes related to merging, splitting, renaming or modifying a program. Community Counseling and School Counseling. FREQUENTLY ASKED QUESTIONS (FAQ) ABOUT PRACTICUM AND INTERNSHIP These questions are intended to assist students in understanding the expectations and opportunities offered in their internship experiences. Clinical Mental Health Counseling University of North Georgia Practicum & Internship Handbook If you need this document in another format, please call Shanta Ghimire at 706-867-2791 or email shanta.ghimire@ung.edu. 1. Prior to beginning internship, all students must have returned the signed internship agreement to Catherine Gray (EDUC 0028). All students are admitted during the summer and begin their coursework in the fall. Students must commit to completing these courses in sequence. 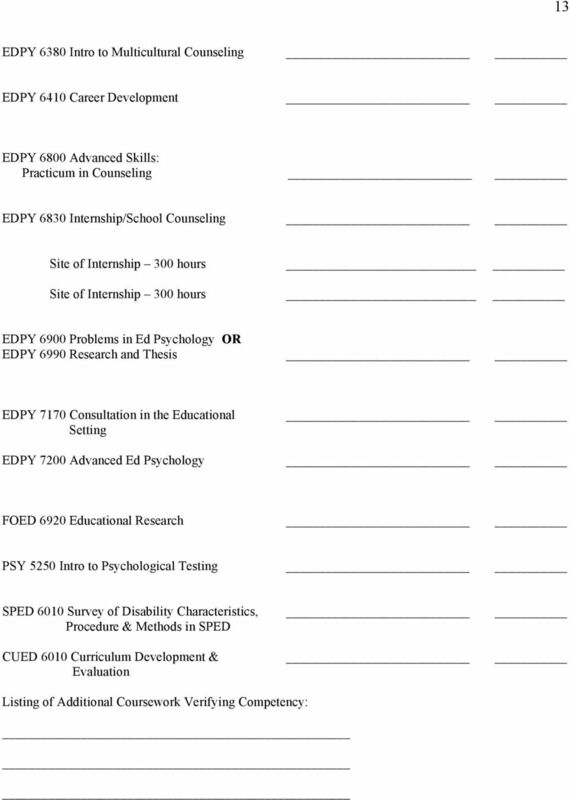 DEPARTMENT OF EDUCATION SCHOOL PSYCHOLOGY PROGRAM PRACTICUM 2015-2016 The Practicum To the Student: This handbook is intended to address some initial questions you may have regarding field placements.